Hey! For you observant types out there, you may have noticed that this is the 100th JSFR entry (although it is technically the 101st entry, the first one is all about the rating system and I don’t really count it as a true JSFR per se). Huzzah! 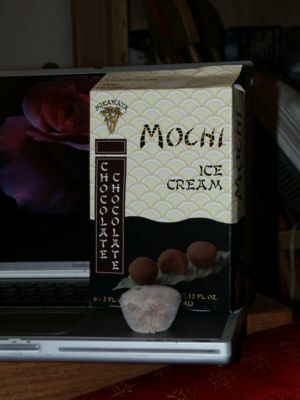 And what better way to celebrate than with chocolate AND mochi? Oh. My. Mochi. If you only have one chance at trying mochi in your entire lifetime, I highly suggest you latch onto chocolate chocolate, especially if you are a chocolate fan. If my pea system went to 6, this would totally top out at 7. Truly. Well, maybe I’d have to knock half a pea off for the rice paste coating but only a really small half pea because the coating is chocolate too! That’s pretty darned rad if you ask me. And tasty in a bland but cocoa reminiscent rice paste coating way. Sadly, there is a whole lot of rice flour dust on the outside which gets all in the inside when you bite into one of these. It really makes my mouth feel a little like I licked the business end of a cocoa dusted chalk eraser. It’s not a sensation that endears me to these critters. And also, the rice paste coating is still mudgie, but in a nicely cocoa-y sort of way. I noticed that the coating on chocolate chocolate is a little thinner and slightly less oddly textural than the other brand of mochi. But! That’s not where these puppies shine. Oh the chocolate chocolate ice cream. We’re talking ice cream that rivals Dove or Haagen-Dazs or whoever else is out there claiming they have the be all and end all of ice creams. Have they tasted the chocolate ice cream in chocolate chocolate mochi? I don’t think so. Wow. Chocolate. And rich. And chocolate. And smooth. Did I mention the chocolate? They not only have tasty chocolate ice cream but there are bits of chocolate floating around in the chocolate ice cream. Tasty chocolate chunky bits. Yummm-mmmm. Now I understand the double chocolate name and I approve. Rating of 4.5 Wasabi Peas out of a possible 5.